Bob Sheard, Co-Founder of FreshBritain, a London based creative agency working with the likes of Nike, Levis, Dr Martens, Arc’Teryx and New Balance, continues his commentary on the business in this latest post. Here he examines why Lifestyle remains a key ploy which brands continue to favour and asks whether they need to find new ways to connect with consumers as the pace of their dialogue quickens and becomes more complex. For years brands have attached a large slice of life to what they do in order to contextualise it. Selling a lifestyle is something that has worked for brands since they began marketing themselves in an organised fashion. Why do we keep falling for it? I’ve been wearing Calvin Klein underwear for 30 years and I have never managed to get a six-pack. It doesn’t work. In my opinion, we will begin to look back at this era of advertising in the same way we now look at 1950s cigarette advertising and wonder why did people fall for it? Why did people think that when they smoked a cigarette that they looked like Cary Grant? They didn’t. If you look at all fashion magazines it is all lifestyle driven, all lifestyle magazines are lifestyle driven, all style magazines are lifestyle driven – why do we keep falling for it? Why do we keep looking at a magazine, seeing an image that has been constructed with the best photographer that the brand can afford, the best stylist that the brand can afford, the best location that the brand can afford, with the brand’s name on it, the brand’s product on it – and then present that as a lifestyle that we think we want to buy into? I think we are on the verge of a massive change and I think it will be the equivalent of the change that occurred in US car advertising in the 1950s. In the 50s, American car advertising was all lifestyle driven – you had Chevy, Buick, Dodge and Ford all presenting ‘Big America’ and ‘Big Cars’. It was about happily consuming ‘Big’ outdoor locations with these big cars. It was a sea of lifestyle. If you look at advertising back then and contrast it with now, from Ralph Lauren to Abercrombie & Fitch, everybody is lifestyle driven and if you go back to the 1950s it was the same. Then one brand came along and changed the status quo. 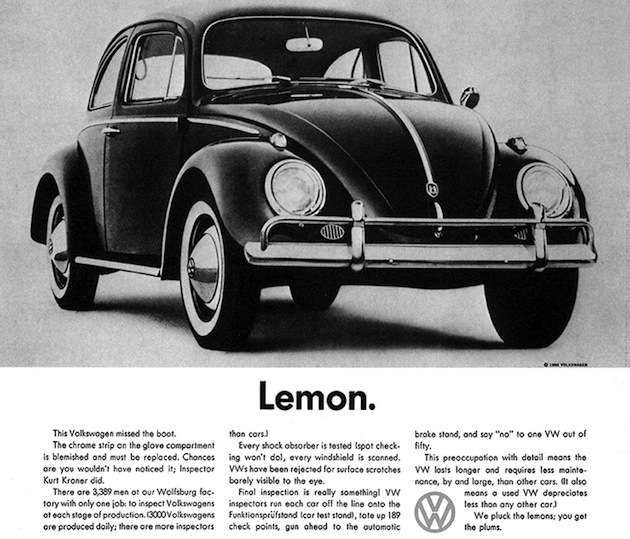 That brand was VW, who less than ten years after the Second World War, took a German car into the American market and using a simple product shot of a VW Beetle called it a ‘lemon’. It was provocative, anti-lifestyle and it really worked. And today, all the brands we work with are gradually shifting away from lifestyle. You have to be at the vanguard of telling the truth, being honest in your advertising and finding that the magic should be in the product, not in the vague lifestyle that doesn’t exist anywhere. There is a paradigm shift in how consumers engage with brands; traditionally brands would connect twice a year – once with the summer campaign and once with the winter campaign. The conversation went, “We only see each other twice a year so I am going to present you with this lifestyle that you can choose to buy into.” Now we interface with our brands everyday via the Internet, social media etc. so a single high-impact advertising campaign isn’t enough. What we have to create are meaningful relationships where brand communication has to be deeper, more honest and robust. Subsequently when you scratch beneath the surface of a brand, unlike vague lifestyle, there is greater depth and personality. The consumer will demand more of it from our brands and brands have to figure this out very quickly because the continual perpetuation of high-impact lifestyle driven advertising is not going to cut it anymore. It is going to stop working and the brands that are developing strong, meaningful relationships with their consumers are going to succeed. This summer’s BBB will be awash with lifestyle and 99% of the brands there will be trying to ‘out-fake’ their neighbour in a world where we find the Truth in the Product.